GP 14 for sale locally. 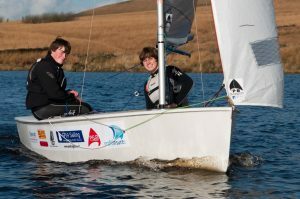 You will be able to view this boat at the Push the Boat out open days on 7th and 28th May 2017 at the Durleigh sailing Club. This dinghy is currently owned by an ex member of Durleigh Sailing Club and is now looking for a new home. Stock Photo, not an image of the actual boat. Full set of sails. Stable family boat. Offers around £350. Contact Mrs Graham on 01278 722284 for further details. The GP14 is a popular double handed sailing dinghy, with over 14,000 built. The GP 14 can be used for both racing and cruising. The boat is relatively heavy, but stable, and the weight and the freeboard together with her lines combine to make her an excellent sea boat. She is also an ideal boat to learn to sail in. The class is raced competitively, and offers excellent close racing; she is a very forgiving and easy boat to sail, but a very challenging and demanding and immensely rewarding boat to sail really well. At the highest level of competition the standard is world class, and it is not unusual to find reigning or past Olympic Champions entering the major GP14 Championships.